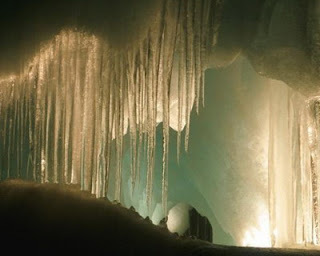 Eisriesenwelt is a most magnificent ice cave in the world. In it, you can see the ice cubes of different forms of unique and funny. Giant ice cave is located in Werfen, Austria. With a length of 42 km, Eisriesenwelt become the largest grotto in the world and long. The cave is formed by the flow of water from the River Salzach. When winter came, the cold air flow covering the cave entrance, causing water to flow slowly freezes. 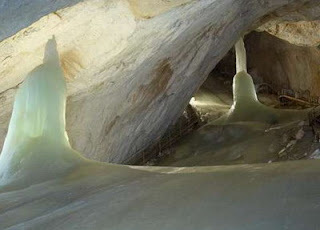 The frozen waters of this beautiful and wonderful formations along the cave. Sights that you probably will not forget for life. Rock sheen of ice on the Eisriesenwelt very refreshing eye. Ice formation at each side of the cave looked so beautiful blanketed parts of the cave. Although the cave has a length of 42 km, visitors can only go so far as 1 km only. Moreover, the cave was formed by limestone rocks that are not accessible to visitors. Eisriesenwelt cave is only open at certain times, which is May 1 to October 26 only, starting at 09:00 to 15:30 local time. By paying about 20 euro ticket. You will be invited to tour around the cave for 1 hour and 15 minutes. Before coming to Eisriesenwelt, you should prepare well physically. This is because visitors will be invited to climb the 134-meter-high cave.You will not be invited to climb like a mountain climber. Visitors will be invited to climb the stairs that have been provided. Fun again, visitors are allowed to bring pets during a visit to this giant ice cave. But do not forget to keep an eye on your animals. There are a few tips for those of you who intend to visit Eisriesenwelt. Use closed shoes and warm clothes. The temperature inside the cave is very cold, to avoid being hit hipothermia, use a thick coat.